Summary: The Ortovox Zoom+ is a simple, no nonsense avalanche transceiver with features that are similar to the Tracker2. Searching: The Zoom+ indicates direction with five directional LEDs. The lights update quickly when the direction changes. The reception range of the Zoom+ (tested on three occasions using six different transmitters) was 10 meters less than Tracker2 and Tracker3 beacons. That's significant. Conversely, the Zoom+ was about 8 meters better than the Trackers when the antennas were in worst-case alignment (in fact, the Zoom+ was better at receiving a signal in worst-case alignment than in best-case alignment). Bottom line? Use narrow search strip widths with the Zoom. Multiple Burials: As with the Tracker2, the Zoom+ illuminates a single light when it senses more than one transmitter and it does not allow you to "suppress" (aka, "mark") a signal so you can search for the next transceiver. Everyone who owns an avalanche transceiver, and especially people who own avalanche transceivers that don't suppress a signal, should learn the generic multiple burial search techniques. Spikes: The Zoom+ handles spikes well (I only tested a one-meter burial). Revert to Transmit: If the Zoom+ is in search mode for two minutes without any motion (e.g., if you are buried while searching), it will automatically revert to transmit mode. Sensing motion is good because it prevents the beacon from returning to transmit mode while searching which will confuse the other searchers. However, there are valid concerns that reverting to send when a second avalanche strikes may result in a transmitting beacon that is no longer attached to a person. And the auto-revert on the Zoom+ (and the Ortovox 3+) can't be turned off. That's a real pain, because if you're testing beacons or doing a search drill and you set it down, it'll start transmitting. Controls: The Zoom's controls are extremely simple. A single dial turns the unit on or off, and an Ortovox "pull-the-two-tabs" switch changes between search and transmit. The two-tabs switch isn't intuitive, but it is very easy to remember. As with the Tracker2 and Tracker3's two-digit display, the Zoom+ displays a limited amount of information. Comfort: I did not receive a harness with my demo unit, but the Zoom+ ships with a zipped pouch similar to the Ortovox 3+. Zippered pouches are comfortable, although they make it difficult to remove the transceiver without first removing a glove. The Zoom+ has pleasant smooth edges. Waxing poetic, it feels similar to a stone that was polished in a river. Upgrades: The Zoom does not support firmware upgrades. As with the Ortovox 3+ and S1+, the Zoom+ selects the antenna that it will transmit on based on the orientation of the device. That's a good feature, because it reduces the challenges of finding a vertically-oriented transmitter. The direction indicator turns off when you're within two meters of the transmitter (which is good). It's slightly unusual that the direction indicator doesn't reappear until you then move three meters from the transmitter. The device makes a subtle clicking noise when transmitting. This isn't noticeable when you're wearing it. Although the Zoom+ software cannot be updated, the 2013/14 model (which includes the RECCO reflector) also includes the features in the version 2.1 update of the 3+. 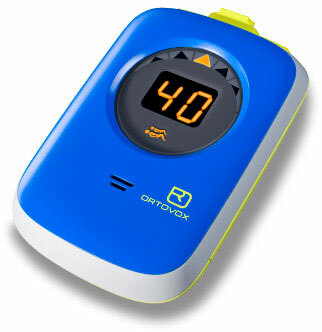 Conclusion: Although my testing was limited, Ortovox appears to have delivered on their promise to make the Zoom+ a functional and easy to use avalanche transceiver. Although given the pricing of the DSP Sport, the Zoom+ is overpriced. Cons: No marking, short range, two-digit display, non-upgradeable.